I've been so busy lately that I've completely neglected my home. Once things settle down I hope to carve out some time and decorate. Lately I'm inspired by clean spaces with pretty and unique details like a colorful rug or acrylic stools. I love them ALL -- so pretty and clean and the design details are phenomenal. Okay. Clearly no one lives in this first kitchen. That gloss on the floor is amazing. Oh how I love white kitchens. They are so bright and refreshing. 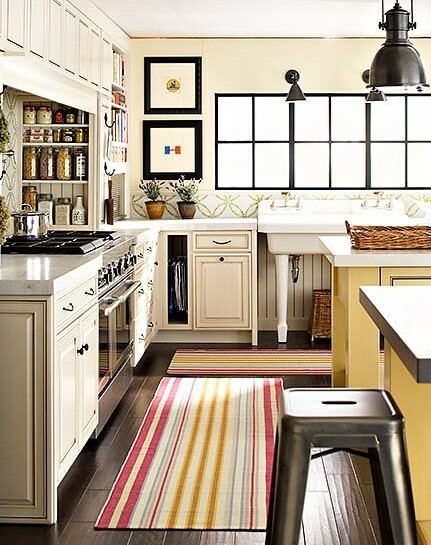 Each kitchen design and layout looks so refreshing. The desire to get more organized just kicked in. something about those stools just work so well in a kitchen. congrats on glitter guide! it's great! Very inspiring! I really love clean and light spaces! I love these. The white and black combo is so chic. Definitely giving me inspiration to file away for our kitchen remodel! Uggh, my kitchen is the worst. I am loving the rooms in photos 1 & 3! It definitely inspires me to make some changes in my own home. Great photos! Such nice images.. My favorite is the first with the feminine details!! Love those kitchen stools! and the hanging lights in the 2nd pic. Those acrylic stools are to die for! I want to pick up and move into that first kitchen. It's adorable! I love the bag hanging on the railing, gives the "lived in" feeling. Love that they're all white. Specifically like the kitchen with the Lucite stools. ooo I love white clean kitchens! The vintage-esque one is my favourite! I'd probably take a huge kitchen over a huge bedroom anyday. 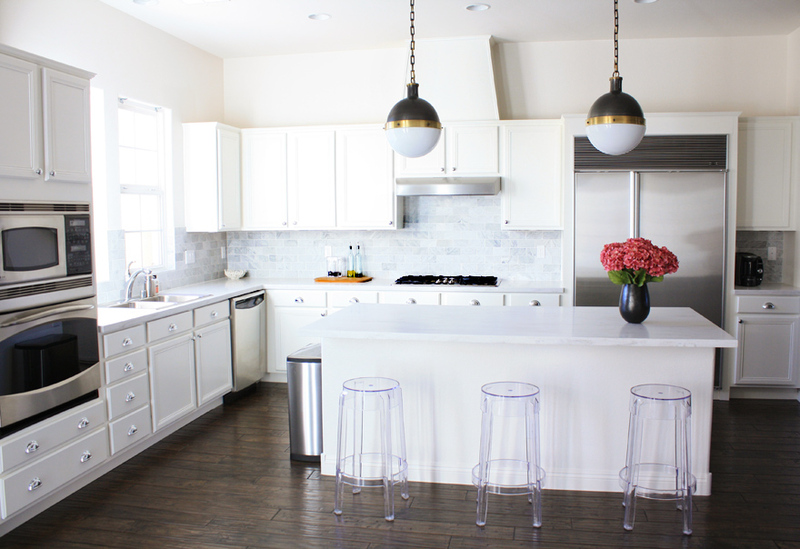 I love the first kitchen, the clear barstools are cool! with these as your inspirations, you home will be well outfitted! can't wait to see what you create. I absolutely LOVE interior design posts! However, they do make me so envious for the kind of house I wish I had... Definitely good for inspiration though! Love using lucite to brighten up the kitchen...Especially when everyone's crowding around...it looks like they're floating! Great looks! That last kitchen is gorgeous! Looks like a Martha Stewart kitchen. It definitely beckons delicious food and lively conversations. I adore the last kitchen. It is actually the kitchen of a beach house my family and I rented a few years ago. It was a dream! The entire house is so great, but the kitchen was definitely the highlight! I love the turquoise elements and open shelving. Our family's favorite part was how the kitchen opened to a small TV room to the right of the island for relaxing after a day in the sun. Thanks for sharing! There's really nothing better than a crisp, clean, white kitchen. Great pics! THese kitchens are so dreamy :)n LOVE the acrylic stools!! Beautiful! My fave is the last one... 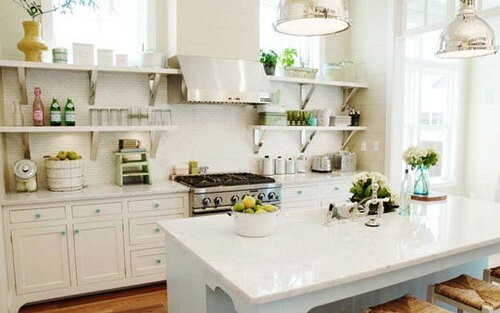 I've always wanted an all white kitchen with open shelving. love the light in these rooms! hopefully someday i can have a beautiful kitchen. Great post! Love the dress and the house! the 3rd picture is just beautiful....I also love the vintage feel to the last one. I love the acrylic stools! I really want those when I buy a house!